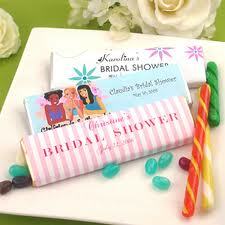 If you do choose to give bridal shower gifts, they needn't be extravagant. You can choose to purchase some nice memorable gift such as personalized sewing kits, "love letter" openers, candies or scented candles. These are just a few examples of the bridal shower gifts that can be purchased either locally or on the internet. Here is a good spot to look around and get some ideas of what is available to purchase. 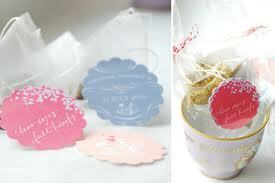 Many of the favors are sold in bulk and are each the same. Some, however, can be personalized with your guests name or the name of the bride and groom. You can choose to make your own bridal shower favors as well. The chocolate bars above are a good do-it-yourself project. While they can be purchased preprinted and put together, you can also do this VERY easily at home. Just purchase the chocolate bars, download a template here and then print the labels. Once they are printed, all you need to do is cut them to size and wrap the around the chocolate bars. This is a great idea (and very easy too) for the do-it-yourself bride. 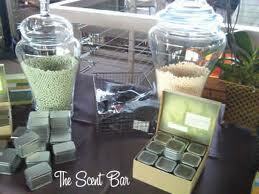 A personalized candy bar is something just about every guest will love and enjoy. However, if you and your guests are watching your figures, you can always check out some other projects from websites such as this for other do-it-yourself wedding favor ideas.